Species Description : This is the largest Lion that ever lived much larger than African Lions with skulls up to 16-17 inches long . It roamed the entire USA and found mainly in Florida , Alaska , California, and now S. Carolina as this bone was just found in an area rarely found . It was massive with a large sturdy body with a shoulder height greater than 5 ft high and a body length of more than 9 feet . Species description: The largest Bear of all time that stood up to 6 ft tall at the shoulder and weighed 1800 lbs which is larger than grizzlies. In fact, at one time the largest mammalian terrestrial carnivore known as tremarctine bears or running bears endemic to North America and Europe. This was a complete carnivore not like bears today as evidenced by high nitrogen bone concentrations so was a killer of its time and lasted for 2.8 million years. More info is listed here http://en.wikipedia.org/wiki/Arctodus. Item Location: Marion Co., Fl 100,000 to 200,000 years old Simus. Item rating and description: (1-10) *9.8* Totally Original Giant Short Faced Bear Entire Right Paw 8.5” long by 8.5” Wide with 20 Complete Bones. This is so unbelievable as no one has this anywhere. This time I outdid myself on rareness as this ranks as the hardest animal to find in fossil records, even greater than La Brea Smilodon, or Dire Wolf. Few of these are present anywhere no matter where it’s found. Only scant pieces are ever found but here you have from mostly the same individual totally original set of 20 bones in the right paw with super claws. Claws if found have no sheath but these are perfect. Each claw of a Short Faced bear is worth over $1000, and this is almost perfect with 2 claws being from another Short faced Bear but size and finger position are accurate. It is just so amazing not even wear except on one metacarpal. Keep in mind even one claw is an amazing find for the animal. I’ve only had a few partial bones from this animal ever and they went for huge prices so here it is something in an original collection for years. I debated even selling this but don’t ask for a discount as my price is great for what it is. I have more requests for this than even cats so here it is!!!! This is an amzing piece Who has one -no one is the answer so what ARE YOU waiting for ????? Species description : This cat evolved from Machairodus and appeared at Miocene –Pliocene border about 5 MYA and lived in Africa as well as Euroasia and died out lastly in Asia and North America about 10,000 years ago so it was highly successful. It was a scimitar cat built like a modern lion that had about a 13” skull but much longer teeth called sabers. It was larger than average saber-tooth cat that was very successful yet hardly ever found in fossil records. Complete skeletons have only been found in Texas and of this animal complete skeletons in Asia have never been found and only a few skulls .The sabers per head size are smaller than other the big cats. It preyed on wooly mammoths as found out in Texas. IT looks like a megantereon however much shorter sabers and less sized lower saber guard and sabers reached to end of lower jaw as this one does. It reached 1.1 meters at shoulder . As said compared to megantereon, smilodon, and machairodotus its sabers were relatively short but still they are nice sized sabers. It provided a great puncturing and gripping force . The skull was longer than smilodon. This jaw had down-turned forward flanges to protect the scimitars . It large canine teeth were crenulated and designed for slashing rather than purely stabbing . Some of the physical appearances were unusual for a big cat as it had limbs that gave the homotherium a hyena like appearance. The forelegs were elongated while hind legs were rather squat with feet planti-grade causing back to slope down towards a short tail. It had a large nasal square nasal opening like a cheetah which allowed quicker oxygen intake with brain visual cortex large and allowed it to hunt during the day instead of night like many cats. It lived 5 million years longer than megatereon. It hunted in packs and not only killed mammoths but also rhinoceros juveniles. Description of species Large Early whale that was the supreme carnivore in the seas at the time of the eohippus .It was found first in USA and is a mammal even though at first thought to be a reptile . It is very large many exceeding 40 ft long and was thin whale very very long. Item Location: Morocco, South Africa – South of Taouz Moroccan Sahara. Rating and Description- (1-10) Rating 9.2 Rare and Remarkable Giant Early Whale Basilosaurus isis 3” Tooth. This is only the second molar of a Basilosaurus I have ever seen. This molar has a very small amount of repair and a little stain. Featured in Prehistoric Beasts as one of most powerful carnivores at any time. Items from this animal are very rare and difficult to come across, especially molars. This tooth is in very good condition with a very special and complete root. The entire tip is also complete with most of the enamel The prehistoric whale Basilosaurus was incorrectly identified as a marine reptile—hence its name, Greek for “king lizard. Again, it will be difficult to find this tooth for sale anywhere as only a few have been found. This amazing creature was as large as a megalodon and ate everything in the seas. However, they are much rarer than megalodon. This is a prize for your collection at wholesale pricing. The pictures will show you. Also, this comes with a beautiful display mount. Species description: Hardly no record of this animal exists except it looks like a large peccary and belongs to Artactyla. This is so rare hardly anything has been written about it but it was named by Cope of the famous Cope- Marsh duo. It is smaller than later Platygonius compresses but looks a lot like it. It was a browsing animal and very few bones have been found, At All!! Read about this animal here and you will know more than 99% of the population. You can look this up and get so little it is amazing!!!! Species Description: The Barbary lion of North Africa evolved around 100,000 years ago from the African Species of Lion . There was single population of lions across North Africa Middle EAST . Western and Southern Asia ad this species most similarly is more like the Asian Lion . It is the most magnificent of all lions in history as these majestic cats were a massive size bigger than any other lion ,and same size as the American Lion(except not as tall at 3.5 ft) and had the best and biggest mane ever that covered over half the body. It roamed over Northern Africa ranging from Atlas Mountain where the later species only dies out in 1921 and in the west Morocco to Nubia. Or Sudan now .The species I have is yet to be found as it was an earlier one but later species were above .It weighed 550-600 average lbs on males, way bigger in length on today’s lion. The manes were on the belly and all around and darker than lions sub-Sahara, which gave it a regal look. These were the ones who fought in the Rome Coliseum with a great mane and the best specimen ever found of an earlier species. 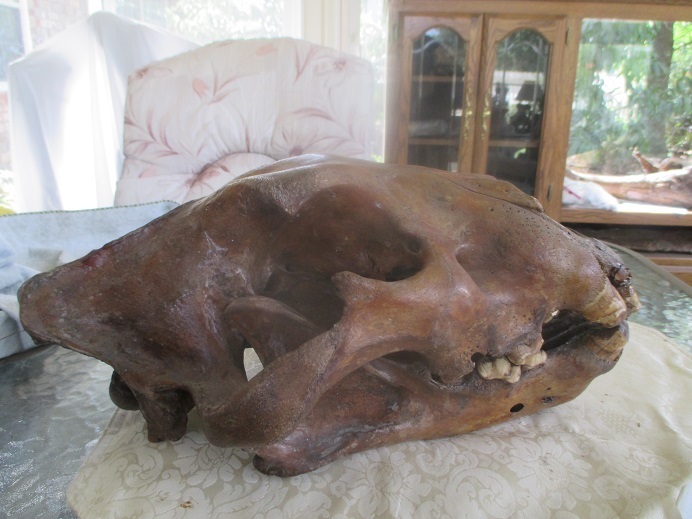 It was believed to be 100,000 years ago when first formed due to simple auditory bulba in the ear stated by American Natural History Museum .I believe this animal is one of the most complete skull if not the most complete of one of earlier lions ever found. These had heads 17 inches long like American Lion and this one is no exception at 17”. It differed as having a grayer shaggier coat, plus the skull and facial was unique. Plus inner ear was different. It says it possessed a higher occiput in back of skull plus more rounded cheek bones. These for thousands of years roamed undisturbed in woodlands and mountains plus desert over a vast territory of now days Morocco, Algeria, Tunisia, Libya, Egypt, and Sudan today. Their decline started during Roman Empire due to massive use at game. I’m a lion man and I’ve never seen even 1 of this species. Item rating and description: 1-10 *10* WOW Unbelievable Entire Barbary Coast Early Unknown Extinct Lion Huge Skull 17” Long x 9.5” wide. 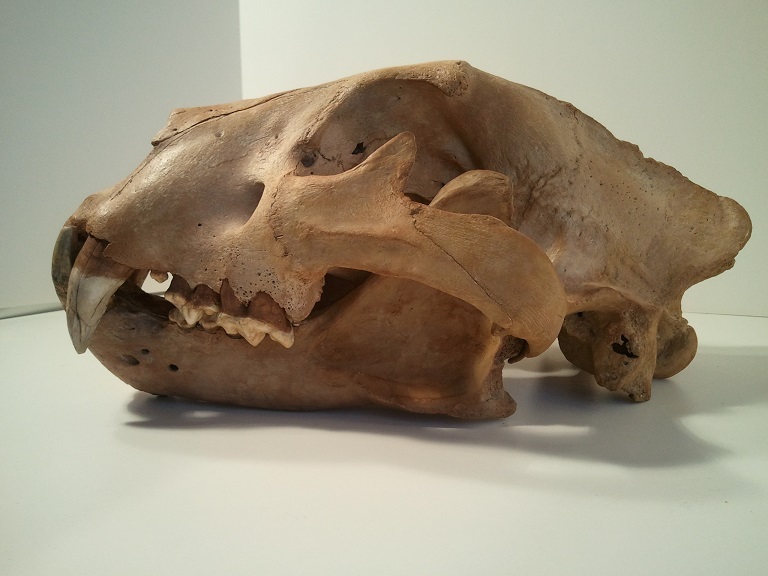 This was thought to be an American Lion, and sent to American Natural History Museum to a paleontologist and due to size and simplier inner ear it was determined to be one of the only known full skull of an Earliest Known Barbary Coast Lions . No other complete skull like this has been found to all knowledge and google checks. Due to dark brown color it may be the oldest species of when it first arrived believed to be found in a cave as the skull is almost perfect. The specimen was bought in Mass. 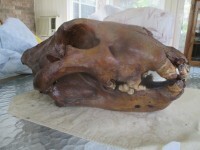 USA in a flea market many years ago so it is so close to an American lion as it wasn’t Ided until sent to museum. It looks so close to me to the American Lion except for slight shape difference as I have one. It is even rarer than the American Lion which I thought was impossible, if it’s a Barbary Coast early species from Pleistocene. This skull is amazing. It was an old animal so old its teeth are worn down in natural life but present. 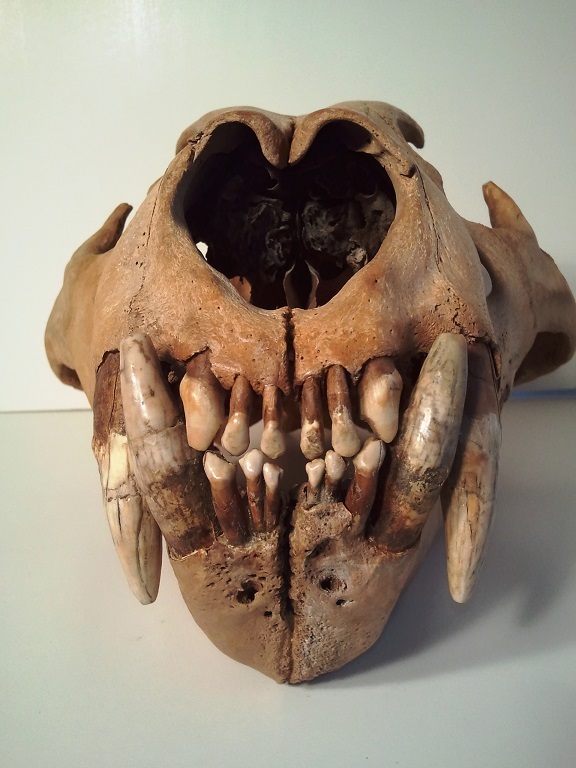 No resto on the skull and complete except for some upper incisors and two lower incisors that I prepped on from a cave lion but even those are real. 4 Bottom incisors are restored. The one side of the upper and lower is missinga back molar but you can tell they fell out in life probably due to fights or dental problems. Remember canines are all there natural just highly worn .The skull is so good it has zygos, condyles, and everything. Also a paleontologist said this was a man-eater or should I say hominid partial apelike creature(possible homo sapiens as they were around at this time ) walking upright due to age of this specimen. Remember Africa had early man way before USA by millions of years. Not only is this upper complete but due to dark brown color it is extremely old. Even American lions aren’t this color unless found in Florida, as Alaska ones never get this dark. No one in the universe has this as it’s the best and most complete of an unknown unnamed species of Barbary Lions if correct .It is worth far more than this as its Pleistocene for sure. No restore, not even touched or doctored or repaired in any way except some incisor teeth added. I’m really speechless on this animal. You can’t even put a price on this as its priceless, but everything is for sale. Simply Awesome and a hominid eater at 99% probablity as once teeth are worn they can’t kill game ,only humans to survive. Anyway it’s once in a lifetime as I have now one of oldest lions of Africa plus one from Europe which is even older. Great Price for a once-in-a lifetime find. An American lion and maybe it is would be at least 80,000 this good. Remember the entire skull except only a few teeth are all 100% natural . At auction I’d have to get more for this specimen. This specimen was never even broken in 100,000 years possibly.I may have it carbon dated. Item rating and description : 1-10 *10* Words really don’t match how great, wonderful, awe inspiring, magnificent this American Lion . It comes with a skeleton w a large % of this lion was In the Americas. The skull was purchased in the USA from a dealer friend from Alaska 25 years ago when all Alaskan lions were considered American Lions-most still do of course as this is . Now almost all people still consider it American lion if found in Alaska , but some research papers consider it spelaea species. Spealea is Europe so actually you cant believe all you read . Many items in google are so wrong . They still haven’t provided an American name yet so a top specialist said call it still Alaska lion or American Lion . After talking to Original owner the Alaskan dealer said American Lion , and whether found in Yukon or Alaska it is still American lion . One of my cat expert friends expert says only maybe 10 skulls at most have been found in Canada, Yukon and Alaska, and Florida combined with maybe 3 in private collections(mine and his included so maybe one more somewhere ) as tAlaska is only place for private collections they were found. No more in years have been found . American lions are from Alaska ,Yukon to Mexico to Florida to California. This skull is from 25 years ago so exact location is impossible to know except Alaska-line-Yukon border is known for sure. 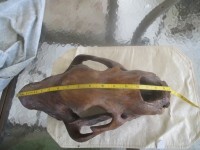 Its 17” Long the skull as measured around the upper curve from back of incisors to back tip of sagittal crest. The skull is so complete bone is at least 97% original. The American Lion to be is the absolute height of the fossil world as I’d rather have that as its rarer than Smilodon material, and I love saber-tooth cats. The American lion and the Cave Lion are one in the same even though some people call this spelaea because no other name can be agreed on by the scientific world. 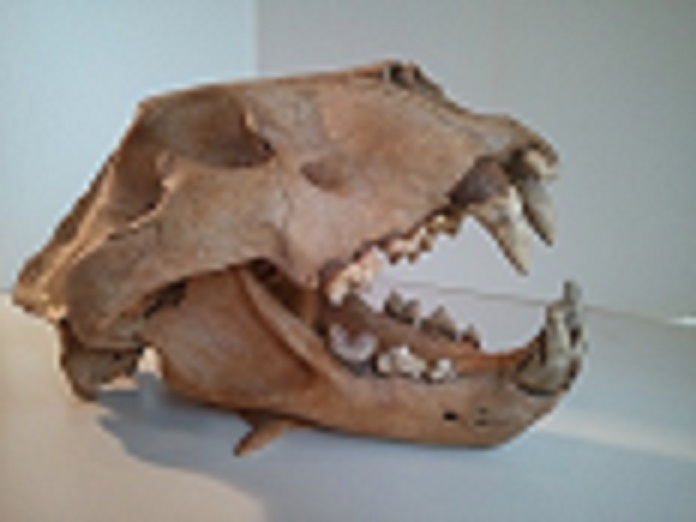 Until 2009 there was no doubt of classification of Alaskan lion but recently they are trying to distinquish this from Canada just miles away with items which is impossible to know . It crossed the Bering Strait 340,000 years ago -one lion and did mutate at certain areas. Some ridilous papers say one small number of bones found in Canada indicate Beringa Lions from Russia made it to Canada and went to American Lion . American Lion was largest species ever Beringa Lions of Russia were the smallest ever even smaller than lions today. Spelea we know made it to Alaska but I believe Alaska is America -isn’t it as many call it this which is also ridiculous as these are in North America and American Lions in Alaska are American Lions also as known by anyone who works with these There is no difference than ones in La Brea in charateristics . In fact they were the same size in most cases and most even bigger in Spelea However rarely are they ever found over 30,000 years old . This one appears to be around that from the color No museum, no private collector known has a better complete skull as this is almost perfect . If you have one send pics.The teeth were repaired and some from other same size American Lion but all teeth are present and real . 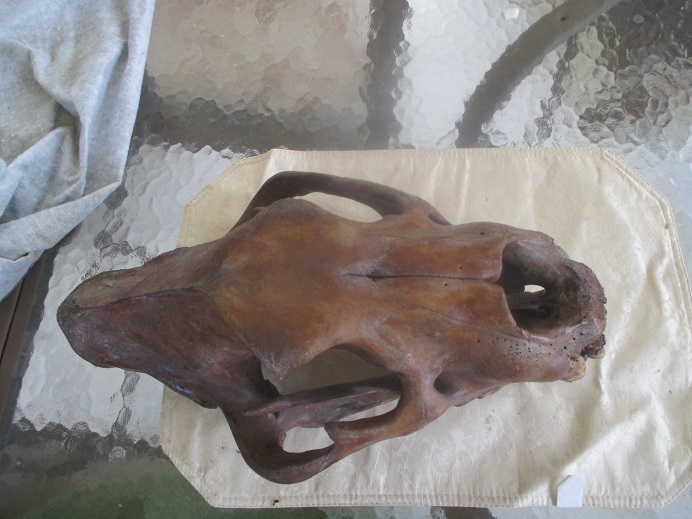 I don’t want to even find fault with this skull as it was done by the nation’s best prepper, my dear friend who is the smartest man in the world who knows everything on skulls of cats. Even a perfectionist can’t find fault with this and who even has partials of this. You would have to be an unhappy person to even try to find something wrong here. I only see beauty and you will too I’m sure. To be it’s the best ever found. 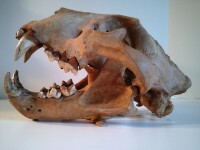 The originality is spectacular as you will never find more lion bone on any skull anywhere. Only crack fills and even parts were American Lion. This skull makes so happy as I can’t describe the emotional feeling of ownership of this cat. It doesn’t get any better, not even the first best original lion I have the upper that is fantastic also. IM so lucky. What preservation this cat shows. It was highly original from one cat but more American lion skull parts plus some modern lion used so no resin . You can’t even tell of crack fills which makes this so amazing . I venture to say this is the best American lion skull anywhere . It gets better –the skeleton was done by the same person and is virtually complete American lion from a couple animals the same size. It took years to get this assembled and 6 years to get this skull. Darker color indicates age or location found so this is amazing as this is darker than normal .Minimal restore and repair is all that has happened here. It will be in my collection for a long time even though I have many people would pay a fortune for this. Money is not important on an animal like this to be viewed over and over. You can’t even put a price on this as it’s priceless, but everything is for sale sometime maybe if a huge amount is offered in later years Ill relent. But that is years away. I tried to put words on this but this is undescribeable so look at pics. Simply Awesome. The pics are amazing. NOT FOR SALE . The History of Lions originates with European Cave Lion(Panthera Leo fossilis in France ) in Eastern Europe then Panthera Spelae with dates ranging from 3.4 Million -500,000 years ago for the beginning with end only 10,000 years ago . All lions are decendants of this first lion including American Lion. All Lions are named for their location due to mutations . Due to fossils being so rare all literature has very few fossils to base anything on . It is believed to come across the Bering Strait 250,000 years ago to Alaska and down through Alaska along the coast and thru western Canada namely Yukon thru British Columbia all the way to LA , California South to Mexico , and then Florida with pieces in S Carolina . Since it came to Alaska almost all people believe its called American lion including me . A few papers after 2009 put Alaskan items separate but those papers can’t see the forest thru the trees. American lion is from Alaska thru Mexico (Northern end) , Canada, Florida and California and the most desired fossil in the world .Cave lions also migrated into Africa only 100,000 years ago with Ivory Coast Barbiary Lions only extinct for the last few hundred years , and African lions which still exists . Russian lions also came from Panthera European Cave lion which are much smaller .ed years ago. I have had every extinct lion(not including subspecies) in the universe which no one on the planet can say . As I said researched have partial elements and small samples and conclusions are based on little . Almost all of these lions have very similar features and only differ by size and small DNA differences . In fact American Lion and European lions have close almost identical DNA . This one was tested 20 years ago by Larry Martin in Kansas at University so it showed similarities with European Lion so he did research way before others on this cat . While those are similar American lion La Brea is also very similar to Alaskan Lions but did mutate some. Still due to location in Alaska all people should call it American Lion. MIne was purchased when all people considered it American Lion .DNA with other lions also is very similar including Lions from LA. Up to 2010 research was done on only a few piece materials of Lions and some considered it spelea species (DNA does match almost identical) yet everywhere else on earth lions are called by where they ended up including American lions. Canada lions right next door miles away were considered American Lions by all as they said they mutated. All persons up to 2010 considered Alaskan lions . Now it really hasn’t changed my or any other persons dealing in Lions as Alaskan lions are American Lions . These people also said Atrox was a little different (yet all Lions come from European Lions ). They said the glacier advance was a dividing line with is so ridiculous as glaciers came as far south as Tennessee in east and California is West . In fact the last million years we have had 9 advances of glaciers every 100,000 years (80,000 ice age glaciers and 20 years warm . In 10,000 more years we will be in another ice age. 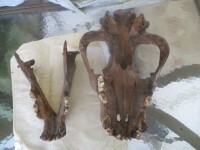 I’ve had American lion and Florida items and bones and skulls are no different than Alaska lions in any way . Also American were like African lions but African came from European lions also . YOu don’t call African Lions European Lions . African lions are much smaller but still basically the same . The Route these lions took was down thru Alaska into Washington the route to California and Florida . I’ve had 5 European lions and sold them all and American lion material and they all look alike. That shows my qualifications as all people to me on lions. People who deal in limited fossil material are basing any judgements on minimal sources as Lion is so scarce in Alaska and anywhere else . A few individuals does not make a compelling arguement compared to seeing these items and mutations always occur to some degree due to environment but since they exist in Americas they are American Lions . I was in Yukon and they had a pelt from an American Lion at a museum and it was labeled American lion, not spealae. 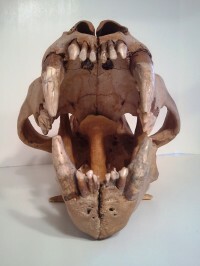 La Brea lions as Ive talked to them ( the museum has had on lions yet many sabertooth cats ) I can get your smilodon material but rarely lion so much rarer . This lion size is truly a King of Beasts . American Lion has almost same DNA as many lions even African Lion but we dont call African Lions spealae which means European Lions because it doesn’t live in Europe . To me the work of 2010 is ridiculous and at minimum should call them Alaskan American Lions . Lions in every location(not identical) but they are trying to put them in a different group from Europe which makes no sense. WE know all lions came thru Yukon, and Western Canada to get to USA. Mutuations occur along the way so please everyone Alaskan lions are American Lions by anyone who really knows lions .Paper people really are limited on fossil tidbits and never see enough to make determinations . As none is available except this one so people who do papers can’t see many fossils. I’ve had more lion fossils thru years than anyone of them by far. They can’t see forest thru the trees so to speak which is reason all knowledgeable people still consider Alaskan Lion as American Lion as Alaska is part of America . 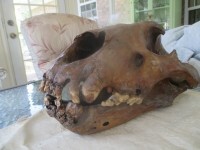 Anyway almost all of mine is from Alaska and Florida except the feet from Europe and the only one in private hands known as no skulls in Florida exist in private collections as well as La Brae Tar Pits -all owned by government .This lion is one -of -a -kind as someone can’t get another anywhere . All people in Alaska and Canada including Yukon as I was there and saw one at a museum as one was found frozen and placed as American Lion. I ‘ve seen so many times google does not have correct info on dinosaurs and mammals so hope this puts to rest any differences. I also know the top expert in the world in Africa and Middle East,and he agrees wholeheartedly. All lions have minor differences even in same countries like Africa but all are closely related -Again all from same lion from Europe -spelea(fossils in France) . Even European spealea now is impossible to find as some were on market a last 10 years but now government controlled areas means no more . These go over $350,000 and will rise a lot next 20 years so ones in private hands will not sell for sure . This cat no one has anywhere on earth. Someday maybe you get the chance to buy but not now . Its worth at least 500,000 as one of a kind . The only place on earth they find American Lion was Alaska but not nothing for at least 10 years so how can you price one-of-a kind. 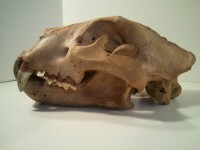 Species Description : The American lion evolved from the earlier Panthera leo fossilis, which I have from Europe, and this skull is believed to be the best specimen ever found of an American Lion.. It was believed to be 250,000 years ago when it first came to Alaska over Bering Strait with earlier lions as old as 500,000 years old even though only bits and pieces up to 350,000 years have been found. Also DNA shows this to be almost identical to Cave Lion so they are identical species just like Smilodon has 3 species all the same animal . There is Smilodon fatalis, Smilodon californicus , and Smilodon floridius all named by location nothing else . Its the same animal just like the main 2 species of prehistoric lion. This is the largest Lion with spealea that ever lived much larger than African Lions- with skulls up to 16-20 inches over 10-15% larger. It roamed in Alaska, California at La Brea, Canada, Mexico and Florida with traces in S Carolina. 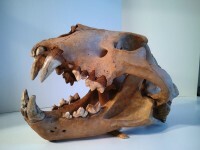 It is the largest carnivore ever except Short-face Bear which I also have a skull. All extinct lions now are not found except Russia. In 2010 Alaskan Lions were changed to spelaea with some people , but all people who work with Lion still call it American Lion. This one was found most probable in Yukon upon further examination which to all is American Lion. All Lions are identified by locations with Gir Forest Lions, African Lions, Extinct- Ivory Coast Barbiary Lions(1960), Russian Lions , and European Cave lions, and American Lions . I have had all of these-one of few people on earth to have these. From all fossils we know American Lion was much rarer than Smilodon when they lived and smarter . At La Brea only 5 skeletons exist , and hundreds of Smilodon found by government so no private collectors here . They have found atrox tracks in Missouri but no fossils found . WE do know Lion fossils first showed up in Africa 1.7 -1.4 million years ago then UK and Germany 680,000 (Spelae), and then they went to Asia much later to Beringa Lions in Russia then over Bering Strait to form American lions from Alaska to Mexico to Florida and S Carolina . So only ones left are ancestors much smaller than original African Lions. Those now probably migrated from Spelea in Europe much later 100,000 years ago to form lions of today as they obviously left Africa then migrated back. Some info is just not correct on lions as many other animals . Some people say American lions arose from one population in Canada Beringa Lions in Pleistocene from Russia but these lions are the smallest lion ever so how did the largest Lion in America come from smallest when right next door lions were in Alaska which were huge as you see one here. There is no difference between American Lion and Spelea except American Lions was in North America which Alaska is a member USA. All dealers who work with this knows this but paper people can’t see forest thru the trees and work with such limited pool of fossils as it’s so rare. Item Location : Gold Mine(Cave) Close to Border in Alaska next to Yukon and also FLORIDA a different species . This was very close to border either way and many more Gold Mines in Yukon . Northwest Of Skagway -Yukon border. No established towns there just mining camps according to original owner . Species description: One of the largest bears of all time that stood up to 5 ft tall at the shoulder and weighed 1200lbs less than the normal Short-face bear that existed as contemporaries from the Pliocene to Pleistocene Epochs 4.9 Million years to 11,000 years ago. In fact, at one time the largest mammalian terrestrial carnivore known as Tremarctine bears or running bears endemic to North America and Europe. This was not a complete carnivore but ate a wide variety of items but did kill animals for a living also like simus short-face bear. It started 1.5 million years before Simus so it is believed also to develop into the true short-face but evolved differently to remain in another form. Item rating and description: (1-10) *9.3* All Original Tremarctos Bear the forerunner to Giant Short Face Bear Entire Left Paw 9.5” long by 7” Wide with 25 Complete Bones. 100% Original Bone with all complete non-broken bones. This is so wonderful to have an entire foot with 5 complete claws with sheaths as no one has this anywhere, I promise!! There have been only a few uncovered and does have some bones from different bears of the same species but they match so well. Bear claws are so rare that are extinct. Few of these are present anywhere no matter where it’s found. I’ve heard of scant material being found but nothing like this is for sale now at this site to my knowledge. These were large bears who started 1.5 Million years before Short-face and are in the same family with some evolving into Short-face and some going to be the now Spectacled Bear so these lasted longer than Short-face bears did. This is a must for a true bear collector. Here you have from mostly the same individual totally original set of 25 bones in the left paw with super claws!!! Claws if found have no sheath but these are perfect!!! Each claw of a Short Face bear is worth over $1000. Not even wear on these is evident. I’m selling at half the price of my short-face bear but it is almost as rare AND people don’t know this bear, showing its rarity!!!! 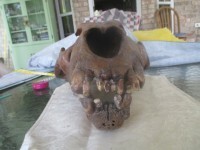 Extra Nice Second Dog Ever Daphaenus felinus Skull in Matrix!!! Species description: This was the second species of dog in North America that lived millions of years ago in western USA and had nice size canines in which to hunt prey on the plains. Not large but cunning and able to bring down prey larger than itself. Item rating and description: (1-10) 8 What a Vicious Rare Carnivore - The Extinct Second Wild Dog of the Plains Daphaenus 6.5” Skull. This is a beautiful fossil, even though it has some restoration, it still is 80% original and complete. The detail of the skull is magnificient for top collectors who want a superb piece. The skull has a few small parts restored such as back of one lower jaw, zygos, a little in the sagittal crest area plus some on top but the teeth are very very good with most original. The color is so amazing it makes a room light up. These go for up to $4000 or more but this quality piece is much less for someone who wants a high quality piece without paying $4000. Buy this while it lasts because this is the lowest i have ever priced this species!!! !